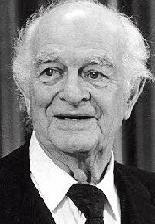 Linus Carl Pauling (1901-1994), a distinguished American chemist, helped to integrate chemistry with quantum theory and founded the discipline now called molecular biology. From 1945 on much of his time was devoted to antiwar activities and stopping the atmospheric testing of nuclear weapons. He is the only person to win two unshared Nobel Prizes, one for chemistry and one for peace.